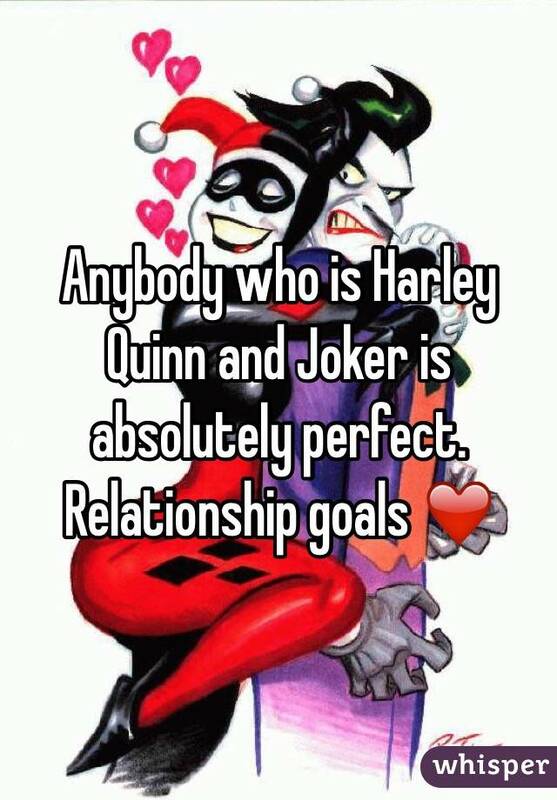 Ah, Harley and Joker. One of the most iconic couples in geekdom, and one of the most screwed up relationships on the planet. With the release of the ‘Suicide Squad’ movie next week, the trailers showing the pair are making the rounds and getting everyone excited. Jared Leto’s creepy laugh and psychotic version of the joker haunting the recesses of every geek’s mind. There he lies, surrounded by knives, guns, monitors, and … baby clothes? Why does Joker need baby clothes? I get the weapons, I get the electronics, but infant onesies aren’t something I would expect even a crazy person like Joker to steal without reason. Seeing this scene in the trailer got me thinking about the relationship of Joker and Harley, and lemme tell you folks, it ain’t pretty. 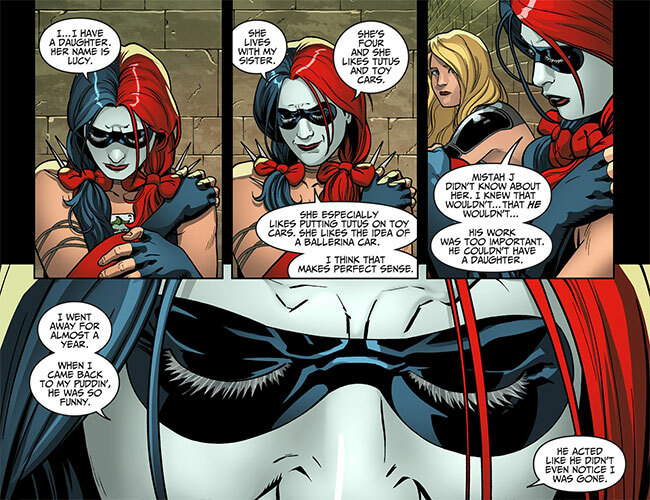 I’m talking specifically about this scene from ‘Injustice: Gods Among Us’ featuring Black Canary and Harley Quinn. In this iteration of their world, Harley has a daughter with Joker named Lucy. Harley says Joker didn’t know she was pregnant, but most likely it was that he just didn’t even care. Harley knows he’d be a terrible dad because, let’s face it, he’s a pretty terrible person – even for a bad guy. It doesn’t even seem to matter which Joker/Harley combination you look at. The results are always a tumultuous, abusive, one-sided relationship that results in an over obsessive Harley getting hurt by Joker. 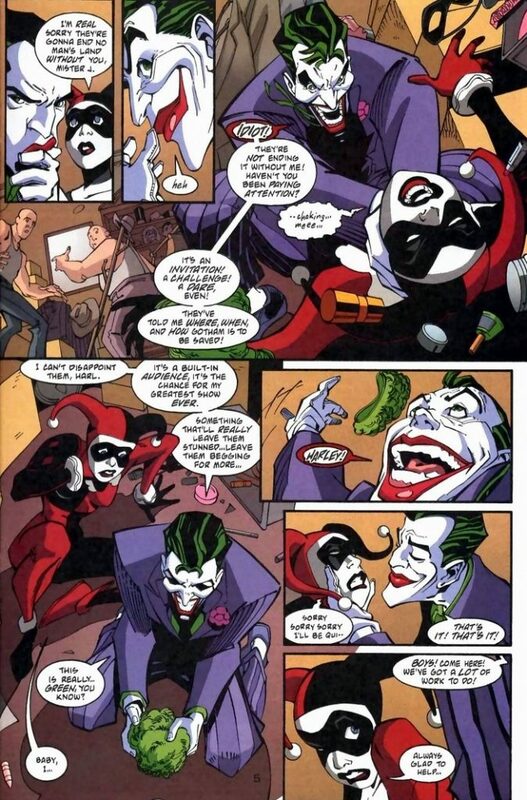 Even in origin stories, Harley is being abused, and still ends up loving Joker for some reason. 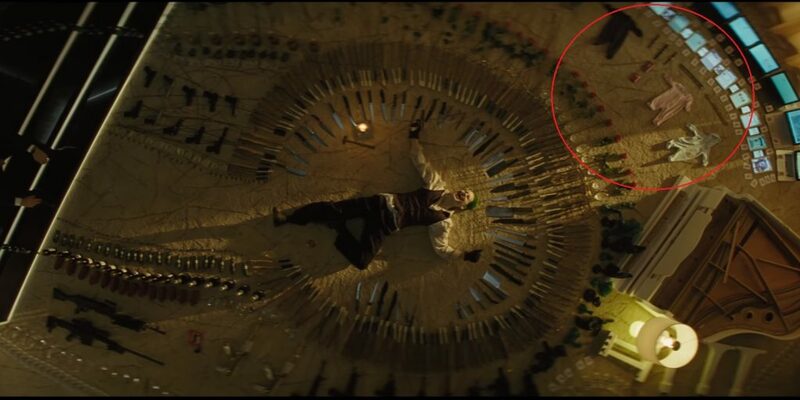 Now, the reason I bring all this up is this – Joker and Harley in ‘Suicide Squad’ trailers seem to be “in love”. They’re not showing any type of abuse from Joker towards Harley. In fact, in one scene you can see that Joker has set up a mannequin with Harley’s iconic black and red costume. So in this Hollywood version (without having seen the actual film), Harley and Joker appear to just simply be “crazy in love”. 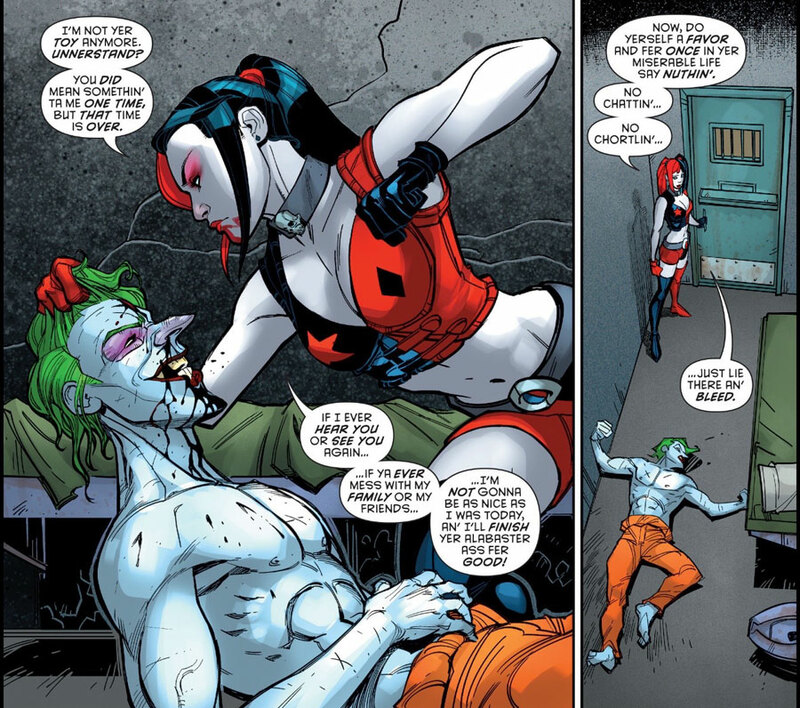 Even in the ‘Suicide Squad’ comics (#14), they’re not exactly the perfect couple. 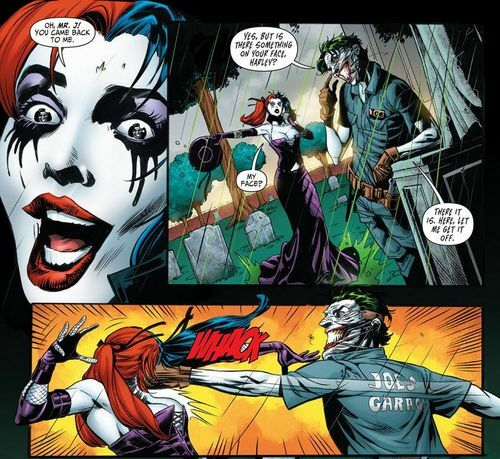 In fact, Joker straight up decks Harley square in the face. There has been some allusion to Harley’s SS origin story in the movie. 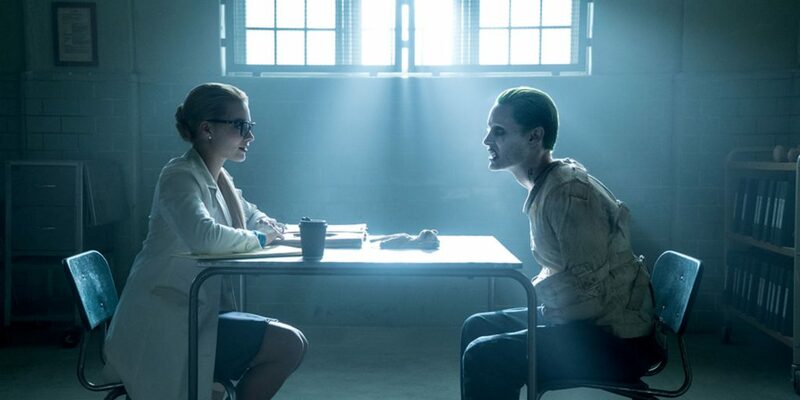 Images depicting her as Harleen before the Harley persona comes out and talking to Joker as a psychiatrist. We also see the vats that created Harley in the trailers as well. I’m hoping they don’t water down Joker’s abuse. That is a driving force in the comics, and it’s something that has shaped Harley as a character. 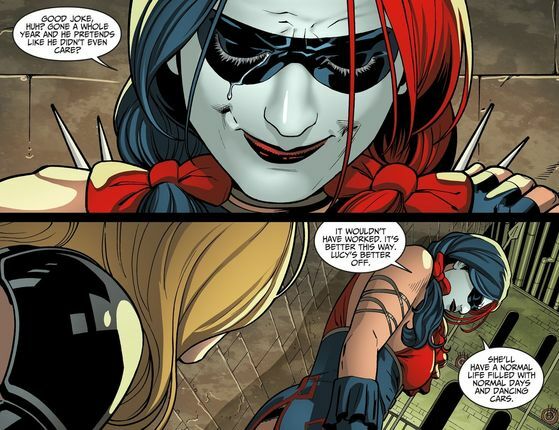 She’s become jaded, strong, and isn’t taking Joker’s crap anymore, as seen in ‘Harley Quinn’ (#25).